Thirty years ago, Curitiba, Brazil unveiled a master plan to address urban issues with environmentally-friendly public transit and social programs. FRONTLINE/World Fellow Tim Gnatek took to the busses, walkways and streets of the now world-renowned city for a second look at what urban planners and environmentalists around the globe point to as a world model. Brazil's motto is Ordem e Progresso, "Order and Progress." In my travels through South America's largest country, from the Argentine border to the tropical Northeast, nowhere did I see this ideal better expressed than in the city of Curitiba. Curitiba is the capital city of Paran·, one of Brazil's southernmost states. It is known internationally for its progressive transportation system, social services and environmental practices. When I first began reading about Curitiba, I imagined a golden city whose planners had solved all the problems of urban living. My arrival in Curitiba, however, presented a more realistic perspective. Far from an idyllic utopia, Curitiba faces the same problems that metropolises around the world do, including overcrowding, poverty, pollution and limited public funding. What's different about Curitiba is that its planners have come up with some creative and inexpensive ways to go about solving universal problems for cities. They've invested in an extensive bus system that operates for less than a tenth of what a subway costs to operate; developed recycling programs that clean up the environment and also address poverty; attracted new industry while expanding green spaces; and used preserved historical areas to revitalize neighborhoods and grow tourism. Curitiba has a radical approach to city planning, unique not only within Brazil but also globally. I traveled to Curitiba to discover what other cities might learn from this model and to see whether this experiment in urban design will last. 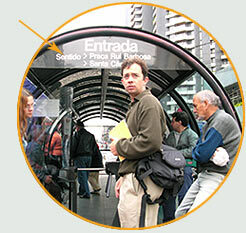 NEXT: Read about the history of Curitiba's Master Plan. Gnatek is currently enrolled in the University of California at Berkeley's graduate school of journalism. He was selected as a FRONTLINE/World Fellow in summer 2003. What is the FRONTLINE/World Fellows program?